Designer's Notebook: Heroes are Made… Not Born! The THIRD Annual Gathering of Glen-L Boatbuilders is nearly upon us, and this year there'll be a very special treat for everyone attending - our recently-retired (from Glen-L) Shop Foreman and Master Craftsman, Allyn Perry, has agreed to join us! Allyn is an amazing wood technician, who built all our frame kits and test boats in the Glen-L shop for around 30 years until he moved to Colorado. This will be Allyn's first time at the Gathering and we're ecstatic …especially since he may let you all "pick his brain" about his secret tips and techniques to make your boatbuilding projects move forward quickly and ultra smoothly. As of the first of September, this year's Gathering is shaping up to be a "can't miss" event, with more than 60 people already committed to attend, bringing 18 boats and a Boy Scout troop, and, of course, Allyn's technical information that money can't buy - and it's all FREE! I sincerely hope that every one of you will find a way to make it to the Gathering 2009. Whether your boat is fully complete, or is still in the "just a dream" phase, you'll find the Gathering to be a wonderful, fun-filled and enriching experience for the whole family. Note: Gayle says "There is such a sense of camaraderie each year and everyone is so eager and generous to share their boat building know-how with each other. This is a great place to network with other builders. Many have even made friendships that go beyond the weekend--even bringing them together to help with their boats! 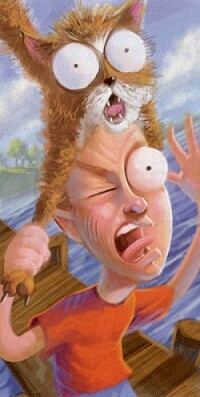 And, the very best part is taking rides in the boats--what a thrill! Be sure and fill out the Gathering Registration Form so that you don't miss out on this exciting FREE event! If you'd like to join in the planning here's a link where you can participate on the Boatbuilder Forum: Gathering 2009 (if you aren't already registered for the Forum, it only takes a minute to do and will be well worth all the great info you'll get by being part of this group)!" "LONG, LONG AGO, BEFORE COMPUTERS..."
Long, long ago, before computers and the internet, Glen-L relied on Authorized Dealers to sell our plans, kits and books. To qualify as a dealer, a company would have to send us a request on their letterhead and then we would provide them with our dealer pricing sheet. All of this was done through snail mail. Dealers would order Glen-L plans and books from us at a discount and then resell them at retail, making a little profit. Some dealers would order quite a few sets of various plans and books and keep them in stock for their customers. Because of our presence on the internet and ease of ordering directly from us, we have only a few dealers left. Most are book dealers since we are the publisher of all Glen-L books. 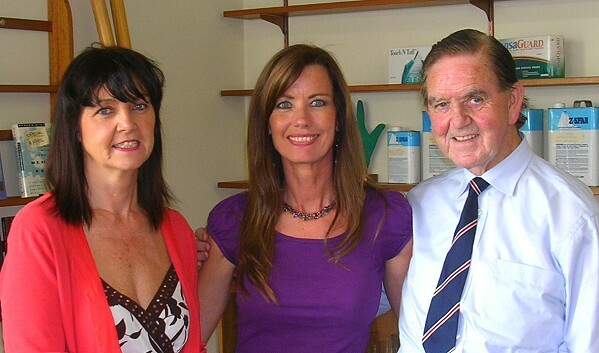 Last month John and I had the privilege of meeting long-time Glen-L Dealer, George Hegarty and his daughter Karen. Since 1967, George has been our Dealer in Ireland and this is the first time he has visited us. Karen came out many years back, but I was out of the office at the time and didn't get to meet her. We had a wonderful visit with George and Karen. They are two of the most gracious people I have met and I thoroughly enjoyed getting to know them. Their company in Ireland is "Glen Sun International Boats Company". In addition to selling Glen-L plans and books, they also have boats and inflatables for sale as well as motors and many other marine related products. 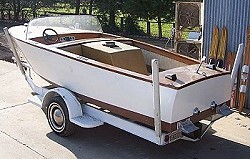 Plus, they provide boat storage and will even provide assistance for building your Glen-L boat. 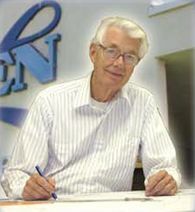 The first boat George built was the Glen-L Cruisette back in 1967 and since then has been involved in building literally thousands of Glen-L designs. He is such a nice man and truly loves everything having to do with boats and has always been a loyal and out-spoken promoter of everything Glen-L.
For those of you in or near Ireland that need a place to build or store your boat, or need anything marine related, we hope you'll contact George. You can even pick up a current Glen-L catalog while you're there! Visit his website at www.glenmarine.com. 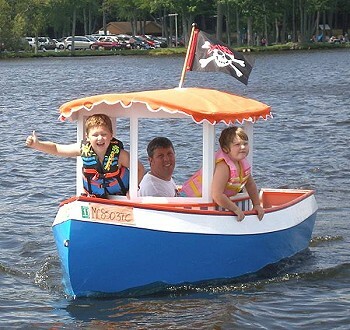 While I only recently launched my Tuffy runabout, to be honest, our family has a long history and very intimate connection with Glen-L Marine. In the early 1960s, my father and a close friend began by building 2 identical versions of your outboard cruiser, the 15' Cruisette. My childhood memories begin with them completing the two hulls during the long, cold winter months here in New Brunswick - in the basement!! In fact they actually dismantled part of the concrete block foundation of the house to carry the completed hulls out as spring came! With warmer weather, work now moved to the main floor of our old country barn where these two boats were lovingly completed as summer progressed. They were both beauties!! Father was so proud of his little cruiser!! Our family keeps many cherished photos of our family cruising the friendly Tobique and Saint John Rivers near our home. A couple of winters later, Dad and his friend again ordered more plans, bought materials and descended the basement stairs to build a couple of mini speedsters, the 8' MiniMaxed. Painted bright red and yellow, these "cuties" were proudly launched in the spring. Over the years, our friends and family have spent literally hundreds of hours zipping along the shorelines!! Focus again switched to cruisers in the late 1960's…this time a bit larger - the 17' Sea Knight. The barn floor was again "boatbuilding central" as Father assisted a couple of close friends in building their dream boats. Again the results were beautiful as traffic on the river increased with Glen-L designs. As the years progressed I have always hoped to continue our father's traditions by building my own special boat - and finally succeeded!! 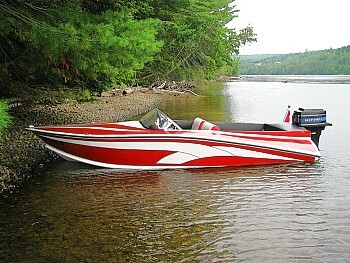 Plans were again purchased - this time for the Tuffy runabout. As detailed in your instructions, I decided to extend the original 13' design to a bit over 14'. I made some slight design alterations, clamped on an older model 40 HP Merc. and headed for the river! She's a "real jewel"!! I wish Dad could have seen her slide into the arms of the Tobique River almost 47 years after his first launch. I know that most boats are traditionally named "female" in gender but right from the beginning I had this one pegged: Say "hello" to the "MAC 1" in honor of my father Graeme MacIntosh who left me with many fantastic memories - including a life-long love of boatbuilding! And thank you Glen-L Marine for being there and contributing in a large part to our family's memories!! And don't go away too soon . . . 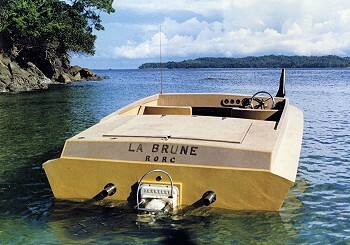 I feel another surge of "boatbuilding adrenalin" coming on soon!!! "So I am a new client, am I? Read on..."
In the early 1980s I built a modified Kingpin - modified by omission of the upper deck. I've included three pictures of it; please take a look. The four people in the first picture are my family comprising one wife, one daughter, one son, and me, seated in that order port to starboard. 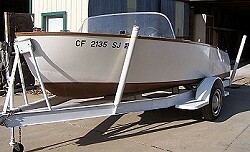 The boat's propulsive effort came from a Ford 351 (USA/Australian) turning a Berkeley jet pump. The boat was in constant recreational year-round use in Brunei waters, but shortly before I retired in 1989 I hit a dead-sailor log one midnight and sank the boat. That, however, is not the end of the story, for a few days ago, these NINETEEN YEARS later, I idly chanced to key "Glen-L" into my PC to see what might come up, and amazingly scrolled my way not into just any old Kingpin but into MY Kingpin. Just like that! The person sitting in your web-site's picture is the same daughter mentioned above. I first encountered Glen-L in a small magazine booklet called "How to Build 20 Boats" in which Glen-L was well represented. I had found this booklet in a second-hand bookstall in Hong Kong, where I lived from 1959 to 1965. In those seven years I found three more of those booklets, and became intrigued by the way Glen-L had over the years been progressively coaxing slab sheets of ply to acquire far from slab curves. Meanwhile I had built two slab sided 16 footers to my own design, both in turn powered with the same pair of Mercury 40s. 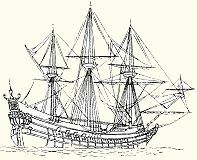 Alas, the first hull was destroyed in a typhoon. My twin powering was a Hong Kong first, and for a while mine was the only boat there capable of towing not only two bare-footers but also the then World Champion Water Skier. 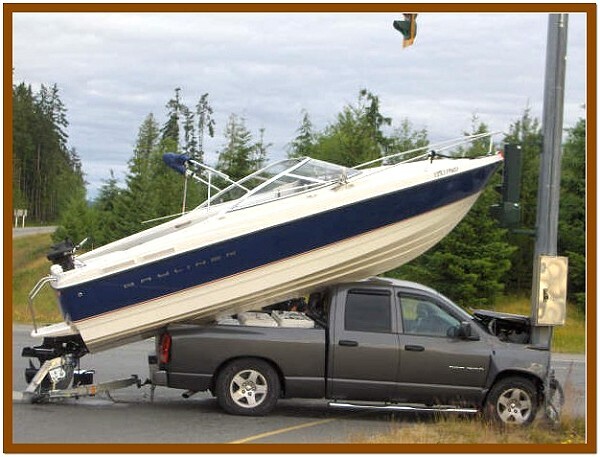 Many thanks for your "Boatbuilding 101" eBook. I still have your three hard cover books on building with ply, installing engines, and building trailers, and 101's generous 79 pages complement them nicely. There must be hundreds of better built Kingpins, and hundreds which followed the design to the letter, and I know that some day another builder's picture will appear on your web page. 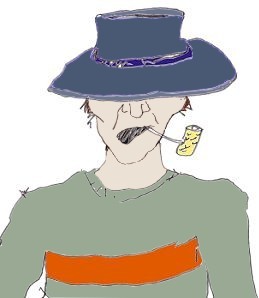 But if you apply the principle, as displayed on the book's page 53, where a builder is pictured who must now be well over the hill like me - I recognize him from my early acquaintance with Glen-L literature - then "my" picture deserves a few more years yet! I have no recollection of having sent you that photo, but not only am I amazed at seeing it in such a respected gallery but am fully aware of the honor which Glen-L has accorded this happy builder. The Glen-L files are full (check it out on the web) of proud, happy people who when they were kids built a boat with an elder's help. Now they, too, want to build a boat with their offspring, because the initial boatbuilding experience struck a strong chord with them along with lasting, fond memories that they want to pass down to the next generation. We were so impressed with the absolute joy, happiness and fun that the youngsters have in a boat which they had a part in building that we produced a group of boat plans just for kids - they can have their very own boat rather than just ride along in the big family one. There is quite a variety of craft designed and built specially for our group of kids. 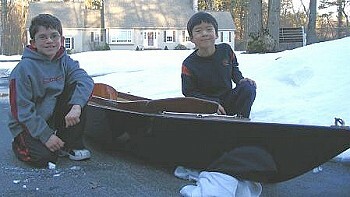 The first was a little 6' rowboat (KID-ROW) that was used in a swimming pool. As the tribe grew we designed more boats especially for kids; the 9' KIDYAK, a 70" paddle-wheel craft (KE-PAU) and of course, every kid's dream, the 9' TUBBY TUG. The family kids and friends learned to kayak, row, and sail in boats that were built both with and especially for them. All these boats and projects had one big thing in common; they made a lot of kids very happy. Maybe part of it was telling their peers about the boat they built with pops or grandpa. Whatever, the only time the big smile was wiped off their face was when they had to leave the boat so another could have their fun. Whatever your status, dad/mom, grandpa/grandma, relative or friend of a young one, become an instant HERO…build a boat with them. You'll find the kids are great helpers, they learn how things are built, and above all they gain the "how-to" that will be invaluable for them in later life. Sufferers of aquaphobia fear water so much that they'll find excuses to not go near boats. But it can be worse. Behavior experts say some aquaphobics, in their doggedness to avoid water, will find "abnormal" ways to bathe. Does it get any abnormaler than licking oneself clean? This is how terrifying water is to a cat: Mr. Bojangles will jump onto and off car hoods, and balance on toilet seats and window sills, but get so much as a drop of water on his paw and he'll react as if he were just burned with a lit cigar. It's so bad that he'll eat a mouse whole and still take no more than three reluctant licks from a water dish throughout the course of a weekend, lest there be an errant splash. At PETCO, the Super Wal-Mart for animals, you can find everything a cat could dream of, including the Pure Commotion Electronic Toy (stand back everyone) and Big Mama's Scratch-O-Rama (now this is kitty heaven). You will not find a cat's worst nightmare: life vests. 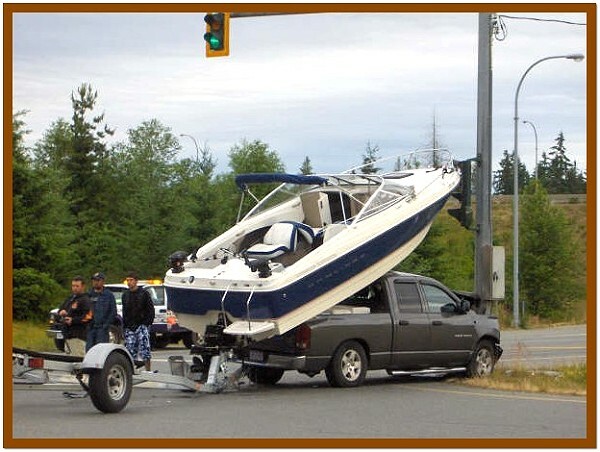 "For boating? Nooo," says a PETCO clerk, standing next to a cat clown wig. It's a touchy subject. Dr. Jennifer Beaulieu, DVM, has treated thousands of cats at her practice near the shores of Lake Winnipesaukee in New Hampshire, but not one for a boating- or swimming-related accident. "I'd never take a cat on a boat," she says, pouncing on the topic. "A cat's fight-or-flight response is really strong because of its sympathetic nervous system. It's what releases stress hormones and adrenaline. Around water it's easily triggered." Transferring a layout line or mark from one side of a workpiece to another using a combination square can be hit or miss. So to make the job more accurate and easier, put together the saddle square shown in the photo. This saddle square is made for use on ¾" plywood. 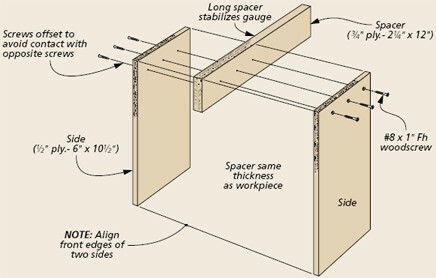 It consists of a ¾" thick spacer sandwiched between two ¼" plywood sides (use different thickness spacers for use on ¼" or ½" plywood). The sides are attached square to the spacer and the front edges are perfectly aligned with each other. The saddle square will give you pretty much foolproof results. Simply slide it over the workpiece, align the reference edge with your layout mark, and mark the opposite side. At first glance, the push block in the photo at right appears to be rather simple. But don't let its appearance fool you. 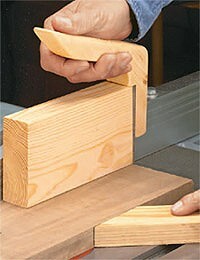 The right push block not only makes working on a table saw safer, it also improves the quality of your work. Note that the push block shown in the photo has the handle located in a "high-mounted" comfortable position. It will keep fingers well above and away from a spinning saw blade. Best of all, it doesn't sacrifice any control. The forward sweep of the handle lets you place constant downward pressure on the work-piece for a steady, controlled feed into the saw blade. The body and cleat are going to get chewed up after passing them over the blade a number of times, so this push block is designed with replaceable parts. All that's needed is to flip the body or cleat over when needing a new edge, or simply replace them with new ones. 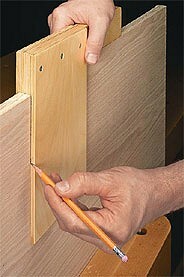 Then you can quickly attach the handle with a screw and get back to work again. Hi Glen-L folks, I have to let you know how GOOD it is to get your e-mail every time... It makes my day and starts me to thinking on boats and the wonderful JOY it brings to family members (ALL) and a great investment in these lean times. Our 1961 Glen-L Mist Miss is still a big SMILE getter at the docks and skis our kids and grand kids with the best of them. Forgive me if my English isn't good. I'm looking for boat plans. 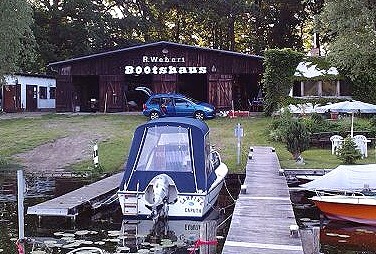 I will build boats in my little bootshaus (boathouse) near Berlin, Germany. It is an old boathouse, built since 1930 and I have it since May of 2009. Just received my free copy of Boat Building 101. I have recently purchased several books on small boat building and this is better than any of them. My ten year old daughter and I bought the Squirt plans in September of 2008. We did not work much on the Squirt for December and January (we went skiing) but we launched the second week of June. It was a great daddy daughter project. We had a blast and enjoyed it all summer. I would like to send some pictures of our build for your website. The plans were great and the help from the Boatbuilder Forum was priceless. Thanks to everyone who helped us. Just a quick note to let you know how much fun I'm having building the Glen-L 13. I have the frame built and the bench built and installed on the garage floor - so far so good. I talked to you on the phone about 8 or 9 weeks ago and after ordering the plans and signing up for the news letters I wanted to let you know building this boat is a lot of fun. From the information and emails I feel I know you and your company real well. What a great company that sells and supports its products as you guys do. I'm a first time boat builder but because of your quality product and support I'm having a ball. I have been taking pictures and when I get further along I will send them to you. I have enjoyed looking at the other customers' boat project pictures and they have given me some good ideas as well. Gayle, I enjoyed the teleseminar yesterday. Thanks for taking a proactive part in helping rookie boat builders like myself better understand the tricks and how-to's in building boats. I am a newcomer to this huge world of wooden boat building and did not know where to start until I stumbled upon your website. Just want to let you know what a pleasure it's been discovering all that your company (actually I find it to be more like a family) has to offer. The Teleseminars, WebLetters, Boatbuilder Forum and Customer Photos have been so helpful and ENCOURAGING! I also want to thank you for the continual email contact. I realize it's "marketing" but much more than that, they always provide valuable content and direction, and communicate a sincere interest in my personal boatbuilding success. It also lets me know you'll be there for support when I may need it. I have yet to purchase my first set of plans. I'm still working on the toughest choice, WHICH ONE? (time-money-space, you know). I believe it may be the ZIP. I plan to get on board soon. P.S. I visited a wood supplier you recommended on your website, Edensaw Woods, in Kent, Washington. They were great. They gave me a personal tour through their warehouse and showed me all the good stuff! Note: Fortunately no one was seriously hurt, this time. Please don't try this yourself. We want to keep you around for a long, long time.